Bruce Lee was a phenomenon. When he emerged into stardom in the early 1970′s, the world was blown away. A martial artist at the top of his form, a captivating presence on film and in person, he was humble, intelligent and well spoken, a combination that successfully shattered the one-dimensional stereotype of the Chinese people as portrayed in Hollywood cinema up to that point. Obsessively driven, he accomplished more in his short 32 years than most do in their entire lifetime, his fame growing to an iconic level after his death in 1973. In 1999 he was named one of Time Magazine’s most influential people of the 20th century, and the awards, honours and accolades he received, both while living and posthumously, remain too numerous to name here. He was also a philosopher and a poet. Though less well-known, this side of his personality undoubtedly played a large role in the near-mystical qualities many claim he brought to his life and work. 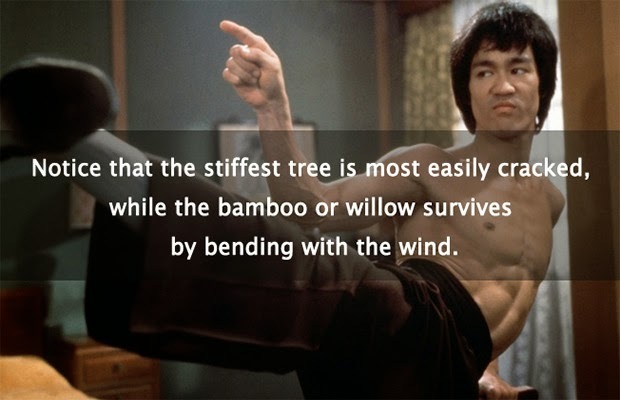 In the creation of Jeet Kune Do, his personal style of martial arts, Lee shed many of the traditional techniques of the fore-running schools in an effort to distill and improve upon the core elements therein, creating a style more in line with the flow of life itself. His personal philosophy was no less controversial. Influenced by much of the wisdom from the east, he nonetheless held no doctrine as the sole arbiter of truth, didn’t possess a belief in a higher power and claimed freedom from limitation as the highest liberation. Beyond doubt, a self-made man. Here, then, are 25 of his most famous quotes. True to form, they are short, simple and direct in their wisdom. Reality is apparent when one ceases to compare. — There is “what is” only when there is no comparison at all, and to live with what is, is to be peaceful. Things live by moving and gain strength as they go.